CHENNAI: Tamil Nadu has been the biggest victim of illegal beach sand mining in the country. 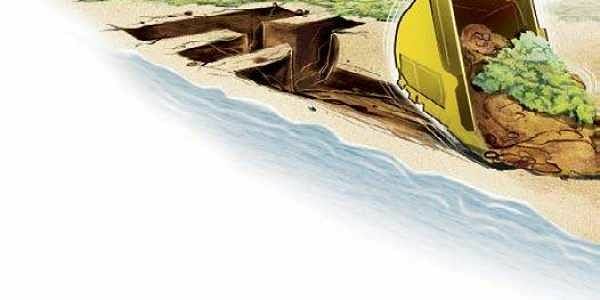 As per the report submitted recently by senior lawyer and rights activist V Suresh, appointed as amicus curiae by Madras High Court in the case relating to illegalities in mining of beach sand minerals in Thoothukudi, Tirunelveli and Kanniyakumari, out of 1.5 crore tonnes of raw sand mined between 2000 and 2017, 57 per cent had been mined illegally. Now, the latest “horrific” amendment, as activists call it, to Coastal Regulation Zone (CRZ) Notification, 2011 by Union Ministry of Environment, allowing mining of atomic minerals like uranium, thorium or titanium in ecologically sensitive CRZ areas, irrespective of whether they are available in non-CRZ areas or not, is only going to deliver a telling blow on the already under-stress Tamil Nadu coast. As per the study titled “Coastal Mineral Mapping” done by researchers in Institute of Ocean Management (IOM) in Anna University, it is revealed that Tamil Nadu arguably has highest concentration of Monazite deposits in the country along its coastline that spans over 1,076 km. Monazite, an atomic mineral, contains 8-10 percent thorium, which is a nuclear fuel. This was India’s first exhaustive attempt to map and record all the natural minerals available, done is tandem with Atomic Mineral Directorate for Exploration and Research (AMD) of Department of Atomic Energy and funded by Environment Ministry. The beach sands of India — especially in Tamil Nadu, Odisha, Kerala and Andhra Pradesh — are rich in several heavy minerals such as ilmenite, rutile, leucoxene, garnet, sillimanite, zircon and monazite. Earth scientist Sreedhar Ramamoorthy of Mines, Minerals and People (MMP), an NGO working with people affected due to mining, says this move by government would prove costly in the long run. “Though, the government justifies it saying atomic minerals are required for strategic and other requirements by the Department of Atomic Energy, it is the foreign companies who are going to benefit. Indian Rare Earths Limited (IREL) has limited capacity to process these minerals. Most of the precious minerals are going to land up in foreign soil in the form of export of raw sand. In future, if India wants to enter into manufacturing of aircraft, the country will need titanium. It takes thousands of years for the coast to regenerate mineral deposits,” he said, and added that he was contemplating a challenge in the court. It’s not just the loss of precious minerals that should worry the States. Tampering of fragile coastline would also invite disasters like salt water intrusion, qualitative and quantitative degradation of ground water. N Chandrashekar, Centre for GeoTechnology, Manonmaniam Sundaranar University, Tirunelveli, who conducted ‘Geospatial Analysis of Coastal Geomorphological Vulnerability along Southern Tamilnadu Coast’, during the period of 33 years (between 1968 and 2001), says the erosion process is more dominant than accretion. “The total area lost due to erosion is 1137.43 sq.metre, while the total area of accreted (accumulated) land was 863.74 sq.metre. The maximum erosion occurred at Sippikulam, Kalaignanapuram and Periasamypuram zones. This may be due to mining of coastal resources,” the study said. While social and environmental consequences seem inevitable, Konstantine claimed that atomic mining has brought serious health complications to residents around the mines. “Since 1965, mining for radioactive minerals has been prominent in Kanniyakumari, particularly in Manavalakruchi. Studies in the neighbouring mines in Kollam have revealed that the effect of radiation has had a far reaching effect, up to 85 km,” he rued. He added that no comprehensive study has been brought to public forum about the health effects of these radiations. “The incidences of cancer has been rising over the decades and most victims from Manavalakuruchi and Midalam, approach the Regional Cancer Centre in Thiruvananthapuram or the International Cancer Centre , by CSI Medical Mission at Neyyoor. “These cases are however are not mapped back to radioactivity,” he said claiming that the incidence of the disease is relatively lower the farther one lives from atomic mining areas. The union government is also reportedly considering offshore mineral exploration and deep-seated and concealed mineral targets. As per the National Mineral Exploration Policy-2016, a document prepared by Ministry of Mines, it is said that preliminary mineral exploration surveys have shown great potentiality of mineral occurrence off the coast on either sides of Peninsular India. Also, the document talks of government identifying deep-seated (below 300m to 1000m) and concealed mineral targets.